Spring is here, and before it runs away from us I’ve been out back enjoying some play time in the dirt. Last year Robby and I installed four raised garden beds that have already seen lots of action as the seasons have changed in just one year. Of course, spring and summer yield the most colorful and obvious crops, but there are a few plants & herbs that stick around all year. Right now our blue hydrangea is growing like crazy, to the point that we have to prune it back to keep the branches from breaking under their own weight. 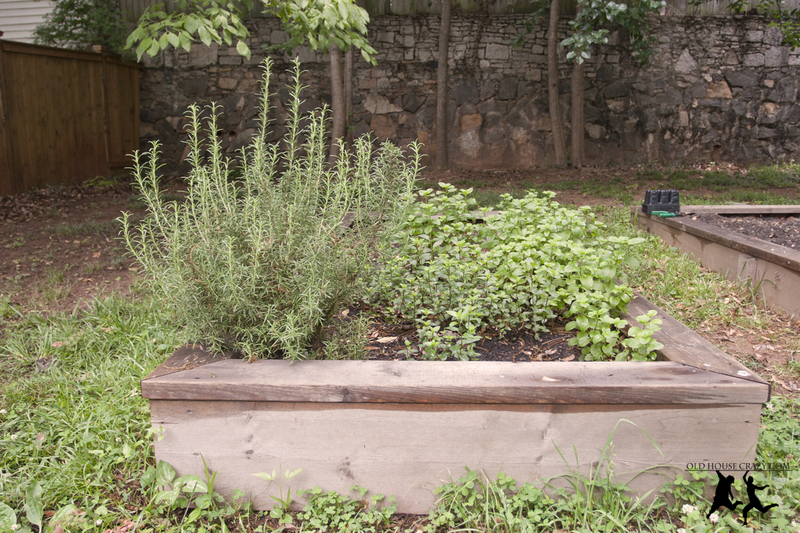 The mint and rosemary that I put in one of the shaded garden beds are growing like weeds, which is great for teas, juleps, and the many dishes we like to have with rosemary, but we can’t seem to consume enough of them to keep their size under control. Anyone want to join us for mint juleps on the porch? Enter the background context of Mothers Day on Sunday, along with a dinner we hosted Saturday night, and lightbulb! I had all the elements of a lovely bouquet that doubled as a centerpiece for the Saturday dinner, and then a gift for my mom on Sunday. Plus, our plants that were growing so fast got the trim they needed without having to waste any of the trimmings. 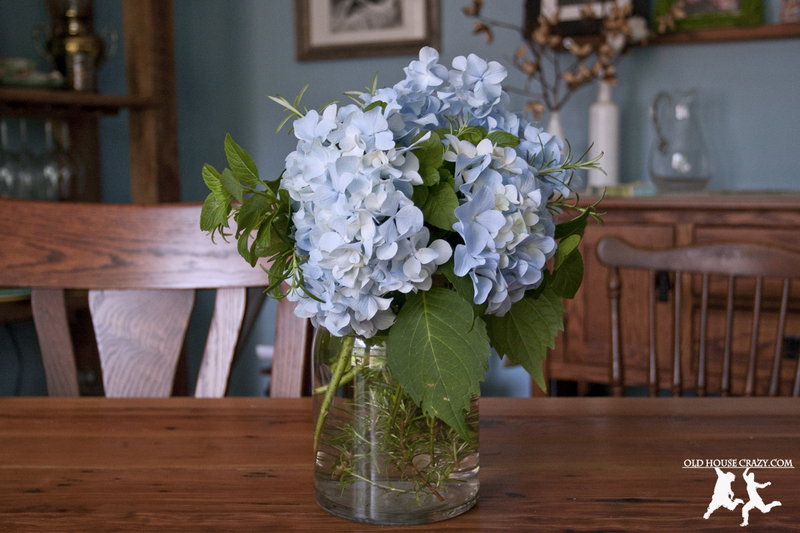 I initially cut three large hydrangea blooms, actually the three largest that were weighing down the branches the most, and four large sprigs each of rosemary and mint. After a preliminary arrangement that was a little heavy on the blue, I went back out and cut the same amount of rosemary and mint again and added it in. After getting over the “is this totally weird?” doubts, I fell in love with this bouquet. 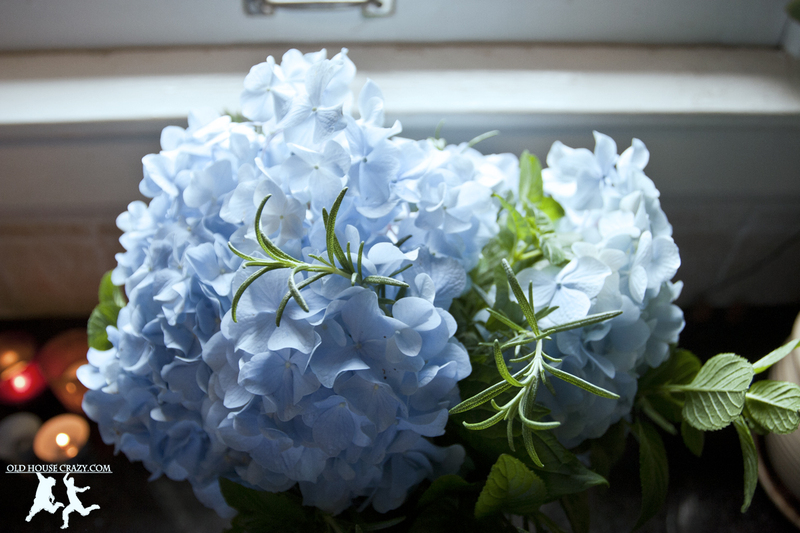 The hydrangeas don’t have much scent to them, but the rosemary and mint really stand up and give a heavenly herbal smell to whatever room you place the arrangement in. Rosemary & mint is one of my favorite scents of homemade soap, too, it’s just such a comforting combination. Our dinner guests Saturday night enjoyed it, and my mom was pretty smitten with it when I brought it over on Sunday. I have been missing the smell in the dining room enough that I might add some jars of fresh herbs on the table, which could be fancied up with candles or ribbons or something. Best of all, this was an extremely low (actually zero) cost mini project. I had the wide-mouth jar left over from something awhile back, so no expense there. 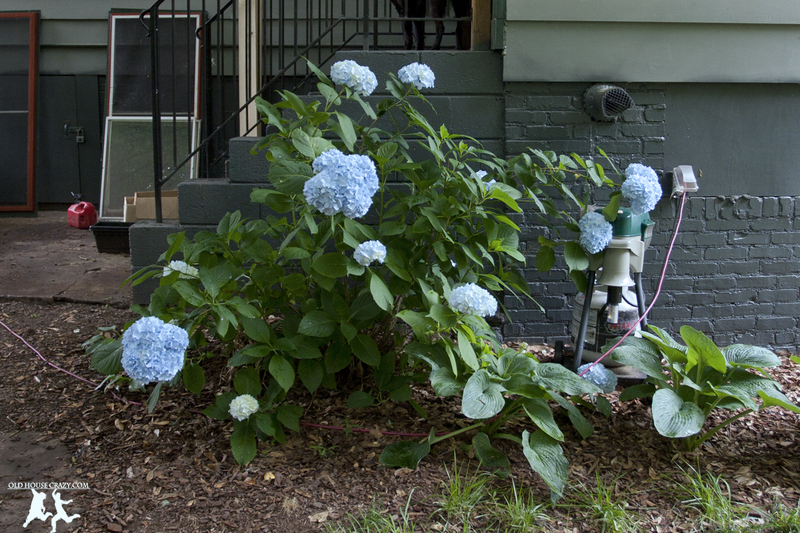 The hydrangea bush has been growing for several years now and was planted by a previous owner (thanks, previous owner!). We bought the organic rosemary and mint plants from Whole Foods last year for about $5.00 each, so that was a $10.00 investment on last years books, which looks like it will keep paying out for many years to come. We don’t even pay for water to keep the plants growing during periods of drought, thanks to our rain barrels! Thanks for reading, and happy Mothers Day! This entry was posted in Better than store bought, Eco Friendly, Garden, Landscaping and tagged Bouquet, Flowers, garden, Herbs, Homemade, Mothers Day, nature, Organic, plants. Bookmark the permalink. 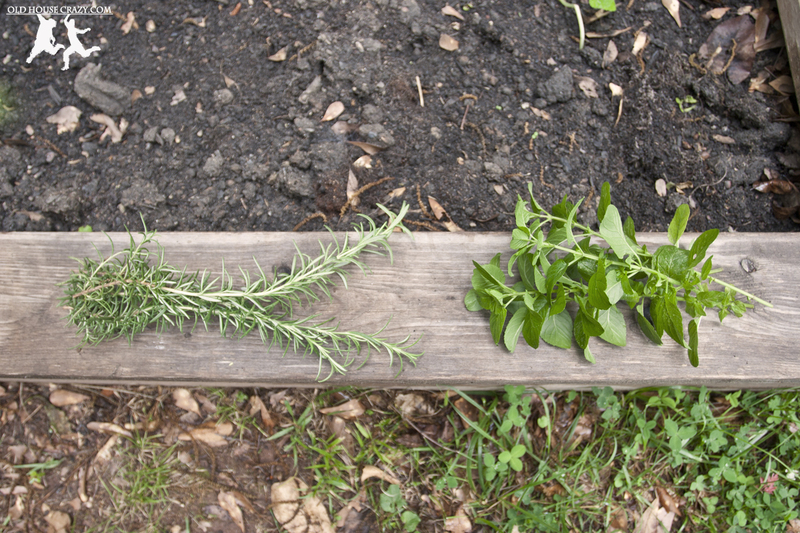 Rosemary will live for a long time if it is watered enough. I, too, love the smell.